During our South India Tour, you will have opportunities to explore a huge collection of temples in Southern India and enjoy the nature’s beauty surrounded by dense forests and shimmering lake. This tour start from Chennai and covering the most popular pilgrimage destinations of South India like Kanchipuram, Mahabalipuram, Pondicherry, Tanjore, Trichy, Madurai highlighted with the natural beauty of Chattinadu, Munnar, Alleppey, Kumarakom and Cochin. Welcome to CHENNAI (formerly known as Madras), India. On arrival at the airport, you will be met by by Asia Senses Indian representatives then transferred to your hotel. Chennai was the site of the first major settlement of the East India Company in 1639, and is now the fourth largest city in India. The town grew up around the Fort St George and along Mount Road and some interesting historic buildings can be seen here. It's true that it is busy, noisy and often extremely hot, but in many ways it is a surprisingly efficient and orderly place by Indian standards. Depending on your actual arrival time, some soft sightseeing can be arranged. The Government Museum is worth a visit if you're interested in the history of the city, and for motorcycle enthusiasts the Enfield Factory tour is a must - though it only runs on certain days of the week, so check days and times before you make the journey. You might prefer to just wander the streets and soak up the atmosphere, exploring the many temples and bustling local markets. 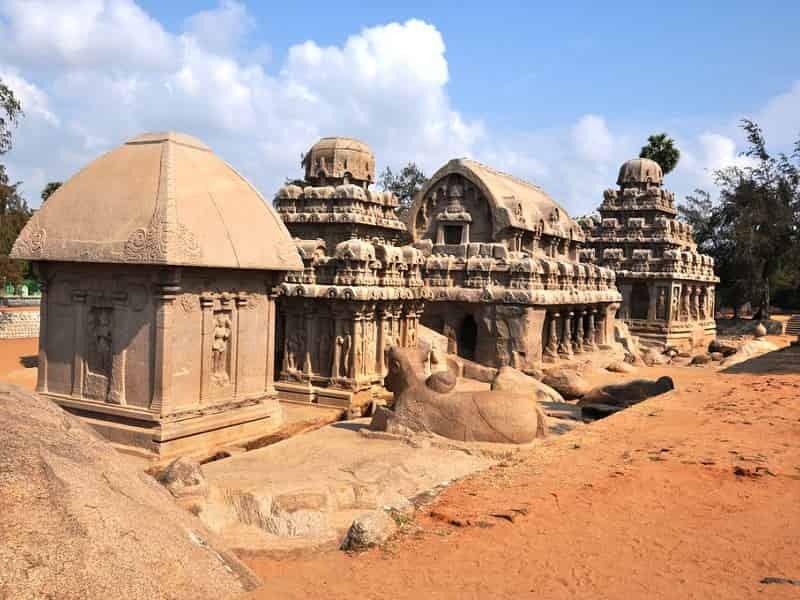 This morning, leave Chennai for KANCHIPURAM, the capital of the Pallava dynasty from the 6th to 8th century and home to some southern India's most impressive temples. Split in to two sections we will visit the nothern Shiva temples as well as the southern Vishnu temples. 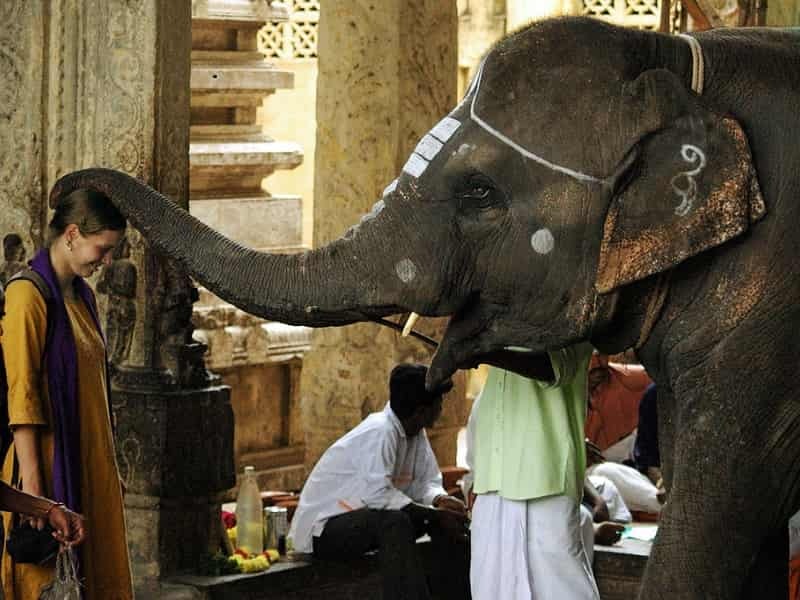 Kanchipuram is also known as the 'silk city of India'. It has a thriving handloom industry with an enviable reputation as the producer of the best silk sarees in India. 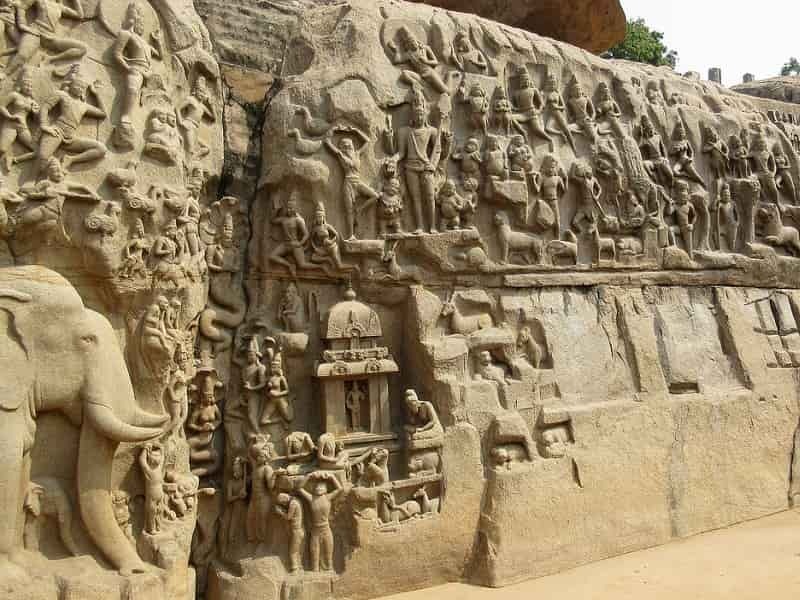 This afternoon, proceed to MAHABALIPURAM, also know as Mamallapuram, for a tour of the highlights. Take a guided tour around the town’s laidback beaches and temples, keeping an eye out for the sculptures and carvings dotted around the place. Visit the incredible 8th-century Shore Temple and its mandapams (carved pillars) to pay your respects to the deity Shiva. Next, continue to Arjuna's Penance, the worlds largest bas-relief carving. This impressive collections of sculptures is one of India's most fascinating ancient artworks. Our final stop this afternoon is the Five Rathas, each one incredibly carved from single large rocks. Built in the 7th century these Hindu temples were covered in sand until their discovery by the British around 200 years ago. Travel by private vehicle for five hours through palm trees and rice paddies to Pondicherry, with a stopover at AUROVILLE. Comprised of 80 rural settlements and home to over 1,500 residents, more than half of who are foreign nationals, the living project of Auroville is dedicated to unity and also houses the world's largest solid crystal. Later, head for the former French colonial city of PONDICHERRY (Puducherry). Under French rule until 1954, the European style of the town extends from beautiful colonial architecture right down to the uniforms of the police. Our first stop today will be Sacred Heart Church, built in 1895 this beautiful red and white church was upgraded to a Basillica in 2011. Then continue to Pondicherry Beach, with it's beautiful golden sand and lapping waves. The rest of the day and evening is free. This morning, enjoy a leisurely walking tour to see local temples and the French Quarter. French rule of the city lasted until 1954 and the influence can still be seen today in the architecture of the old town and the many French-India restaurants. Another highlight and one that brings many travellers to Pondicherry is the the popular Sri Aurobindo Ashram, whose spiritual tenets combine yoga and modern science. The rest of the day is free for you to take part in the activities of your interest. You can explore the surroundings on your own, can interact with the locals, can relish sumptuous local delicacies, can visit the local market and more. After breakfast, head away from the coastal Pondicherry to an important centre of South Indian religion, art and architecture, Tanjore (Thanjavur). En route stop to visit temples in the towns of Chidambaram, Gangaikonda Cholapuram and Darssuram. In CHIDAMBARAM, visit the Natraja Temple, the present temple dates to the 10th century, making it one of the oldest temples in Southern India. Continue to GANGAIKONDA CHOLAPURAM where we visit Brihadisvara Temple, completed in 1035 it is a great example of a Dravidian style temple. Next, visit DARASURAM, home to the 12th century, UNESCO world heritage listed, Airavateswara Temple. At this temple you'll witness some well preserved stone carvings including a number of Chariot inspired structures. Our day ends this afternoon upon arrival in to TANJORE - the rice bowl of Tamil Nadu, where you'll have the evening free to relax or explore this colourful city. This morning, visit the World Heritage-listed Brihadeeswarar Temple, an awesome, thousand-year-old Hindu marvel. Dedicated to Shiva, it is one of the largest temples in India and was completed in 1010. Keep an eye out for the sacred bull, carved from a single peice of granite measuring around 5 x 4 metres. After that, you’re off on a drive to Karaikudi (2 hours away), a Heritage town in Tamil Nadu, famous for its palatial limestone structures. Upon arrival, have lunch in Karaikudi. Be sure to sample some spicy Chettinad cuisine while you're here. After that, visit the antiques market in Karaikudi and the local weaving units which produce the famous Chettinad weaves, then continue to your hotel tonight in CHETTINADU. Check in and free at your own leisure. OPTIONAL: For the dinner, take a cooking class at Bangala Hotel using ingredients grown on-site. Some common dishes that you may learn to make include pepper chicken, seer fish curry, and raita, or cool, refreshing yogurt laced with sweet pomegranate seeds. Take a morning walk around the village in Chettinadu and get a taste of village life. You will see paddy farming, small villages, bazaars, shrines dedicated to folk gods, and if the timing is right, you will also be able to see festivals and celebrations. After that, visit some havelis (mansions), whose grandiose architecture will no doubt impress. Check out then have lunch before continuing to Madurai, 2 hours away on the banks of River Vaigai. Arrive in MADURAI, then check in the hotel. 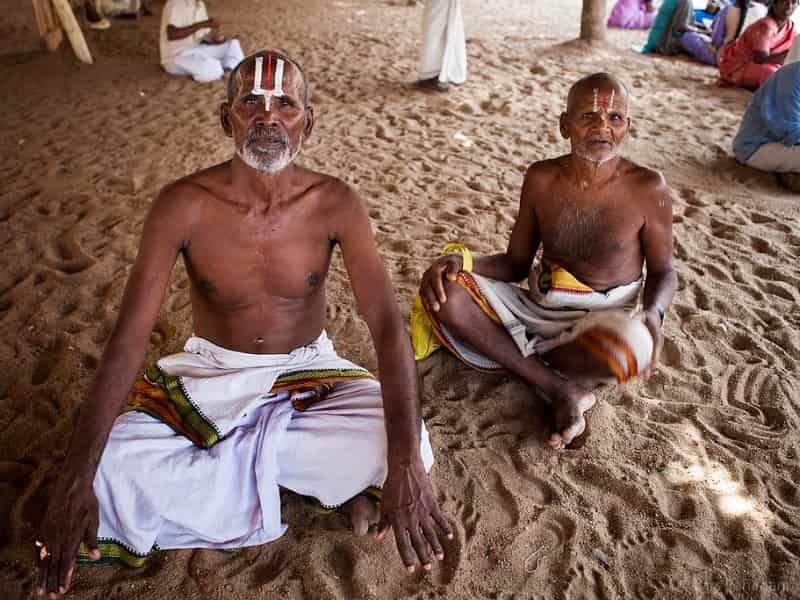 Madurai’s Tamil roots stretch back 2,500 years, making it one of the oldest cities in India. Later, wander through the colourful markets and bazaars. Toward the end of the day, make our way to Meenakshi Temple to enjoy an Aarti Ceremony, which involves candles and music in praise of the gods and goddesses being worshipped. After breakfast, proceed for half day city tour of Madurai, first up visit Thirumalai Nayakar Mahal, a temple built in the Indo-Saracanic style by the Nayaks. The main attractions here are the musical pillars and the pathway. Continue to Thirupparankunram Murugan Temple, located around 8 km from the center of Madurai city. This temple is cut straight into the rock and is considered one of the six abodes of Lord Murugan. 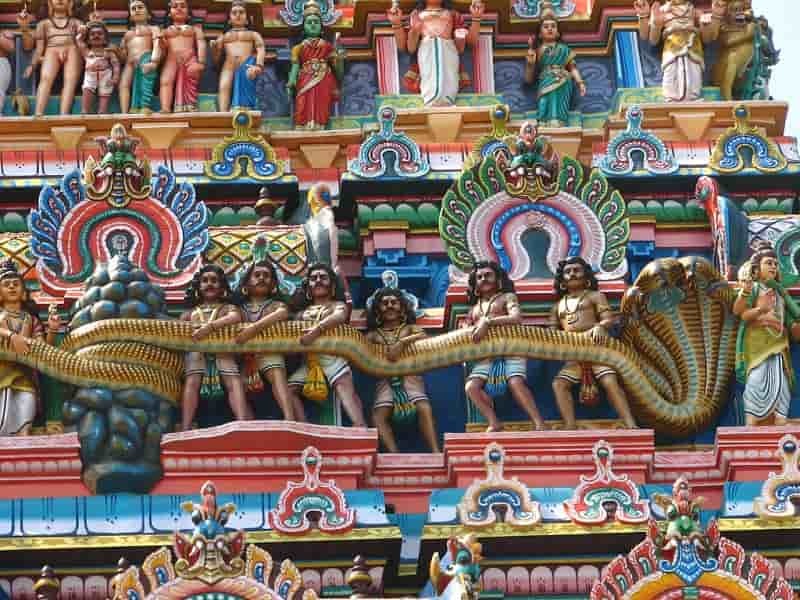 After lunch, revisit Meenakshi Temple, for a second chance to view the magnificently carved temple. Considered by some as the holiest place of worship in South India, it draws thousands of devotees everyday. End the day exploring the Art Museum to see a superb collection of carvings. Today, make our way to TRICHY (also known as Tiruchirappalli). Trichy is located right in the centre of Tamil Nadu and is an important religious site since the 3rd century BC. Our first stop is Sri Ranganathaswamy Temple, this colourful temple covers 156 acres and lies on an island formed by the Kaveri and Kollidam rivers. Dedicated to Ranganatha, a reclining form of Vishnu, it is believed that the sight on where the temple stands has existed since the 2nd century. Your local guide is on hand to show you around the temples and explain the rituals which locals may be performing. Next, climb to the Rock Fort Temple for views across the town. Originally built as a temple by the Pallavas, it's located a top a ancient rock meant that it was eventually used as a fort. The Rock Fort temple has witnessed fierce battles over the years and played an important role during the Carnatic wars, helping to lay the foundations of the British Empire in India. Also visit Sri Jambukeswarar Temple, built by Kochengon, a Tamil king during one of the Early Cholas, said to be around 1,800 years ago. This evening we transfer to the railway station to board our overnight train journey to Kochi. It's recommended to brings snacks and supplies for the journey and the following morning. Arriving into KOCHI train station this morning you'll be met and transferred to your hotel. Long famed in the history books, Kochi (formerly known as Cochin) is a veritable melting pot of Portuguese, Dutch, Chinese and British influences. The cosmopolitan mix of cultures makes the city truly fascinating. Spend the rest of the day at leisure or explore the local area. Your hotel is a short walk from some interesting local restaurants and shops. 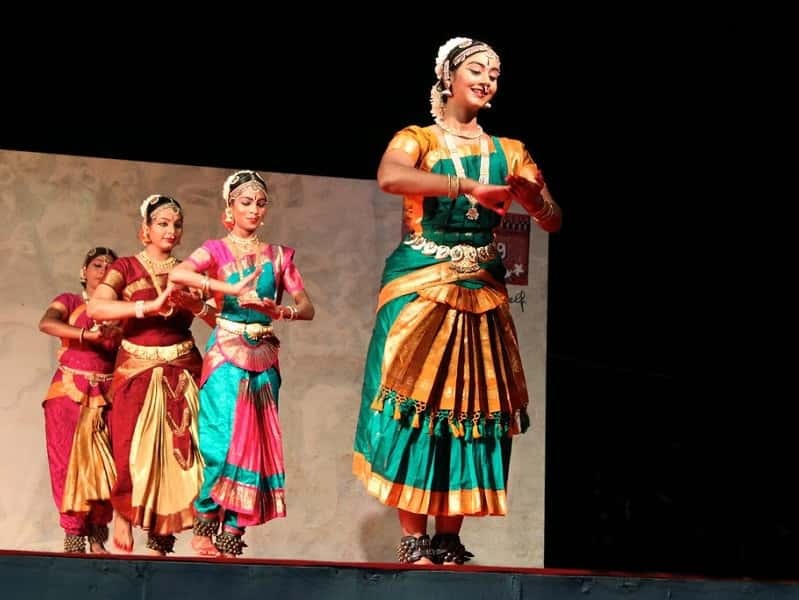 OPTIONAL: This evening, watch a Kathakali performance. Kathakali is the fascinating traditional dance form of Kerala. Take a tour in Kochi this morning with your local guide. Kochi is now the home to some of the oldest European architecture in India and has been a significant settlement ever since Cochin Harbour was discovered. 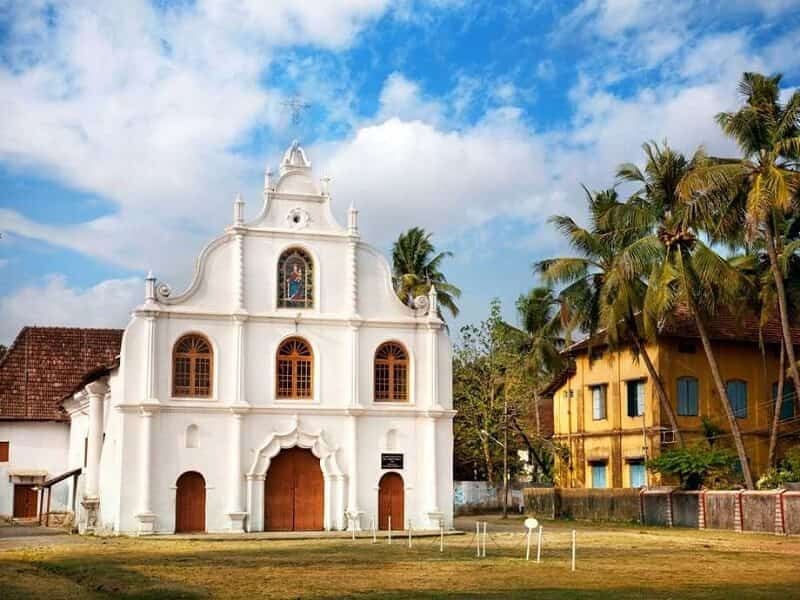 Explore the winding streets of the old town then visit the Dutch Palace (Mattancherry Palace), which was built in the 16th century by the Portuguese before the Dutch renovated it. Then check out the oldest functioning Jewish synagogue in India, the Paradesi Synagogue (exterior only). Later, drive to see the elegant Chinese fishing nets. The tour takes around three to four hours, following by a rest stop for lunch at a local restaurant. After lunch, drive east to MUNNAR through changing landscapes as you leave the coastal area and head up to the hill tea plantations, passing on route rubber, pineapple and coconut plantations. Look out for some wonderful waterfalls on your way up to the tea country. Check in to your hotel then free at leisure. You might have time to wander through the hotel's gardens. Stroll through one of the many tea plantations with your guide, who will give you a brief explanation about the different varieties of tea and how they are processed. The walk through the tea plantations is very flexible and can be tailor-made to suit your fitness level and plans for the day. Taste some tea this afternoon at a local factory where you can learn about the tea picking process. Then we'll visit a local market before heading back to our hotel. The rest of the day is free for you to spend at your own leisure. This morning, travel along a winding road through rubber and pineapple plantations to THEKKADY and explore the Periyar National Park and Tiger Reserve, perched lakeside in the ranges of the Western Ghats. The sanctuary surrounds a picturesque lake, which was formed as result of a dam that was built in 1895. It ambles through the contours of the wooded hills, and is a permanent source of water for local wildlife. This afternoon, take a tour of a local spice plantation. If you have time, attend a demonstration of Indian martial arts (kalaripayattu) at the Kadathanadan Kalari Centre. In the early morning, take a guided nature walk in the acclaimed Periyar Wildlife Sanctuary (approximately 3 hours). As the jungle wakes, you have the opportunity to potentially see black monkeys, sambar deer, giant squirrels and even wild boar. The birdlife is impressive too. NOTE: Don't forget comfy shoes, your camera and insect repellent. After brunch, travel for around three to four hours to the KERALA BACKWATERS. Upon arrival, board your traditional private rice barge and spend your afternoon and evening relaxing as you float around the waterways. 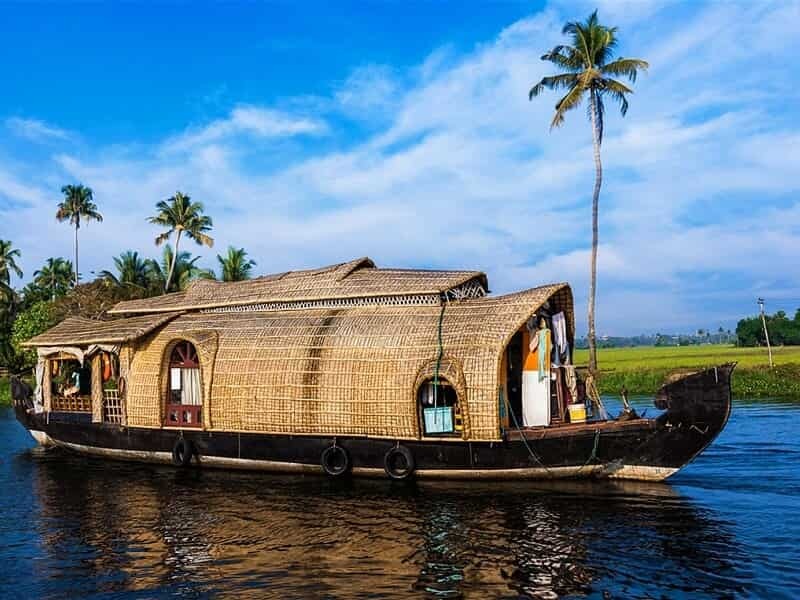 The rice-boat takes you sedately along the enchanting palm-fringed backwaters, covering a distance of some 20 kms, during which time the boat glides past local villages and fascinating scenes of everyday rural life. Watch a beautiful sunset over the backwaters and enjoy tasty meals (starting with lunch) prepared by the on-board chef using fresh local produce. After our final meal on board the houseboat, disembark at KUMARAKOM, a cluster of islands on Lake Vembanad. After that, head out on a village walk. This is a great chance to meet and talk with the people who live in the backwaters, stroll under palm trees and weave in between the rice fields in this tranquil landscape. OPTIONAL: This sleepy hamlet is surrounded by a maze of tropical waterways and shrubs, the ideal spot to while away a couple of days. Consider visiting the local bird sanctuary - spread across 14 acres it's popular with migratory birds including Siberian cranes and parrots. Today marks the end of our memorable journey. After breakfast, travel back to Kochi with an included transfer to the airport.